The church’s practice of infant baptism came under attack in the sixteenth century. Since that time, many Christian churches have rallied against the practice, administering baptism only to believing adults. From Ligonier Ministries’ 1997 National Conference, Drs. John MacArthur Jr. and R.C. 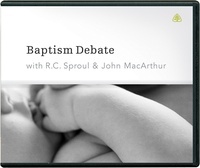 Sproul discuss their views on the Biblical meaning and mode of Christian baptism. Dr. MacArthur presents the credo-baptist position and Dr. Sproul presents the historic paedo(infant)-baptist position.